Will Flame in the Mist be the best fantasy novel of 2017? For me, Flame in the Mist is the epitome of YA fantasy. It has all the elements that I look for in a book, and it executes on each of those elements so exquisitely. Getting to read an ARC copy of this book was truly an honor. 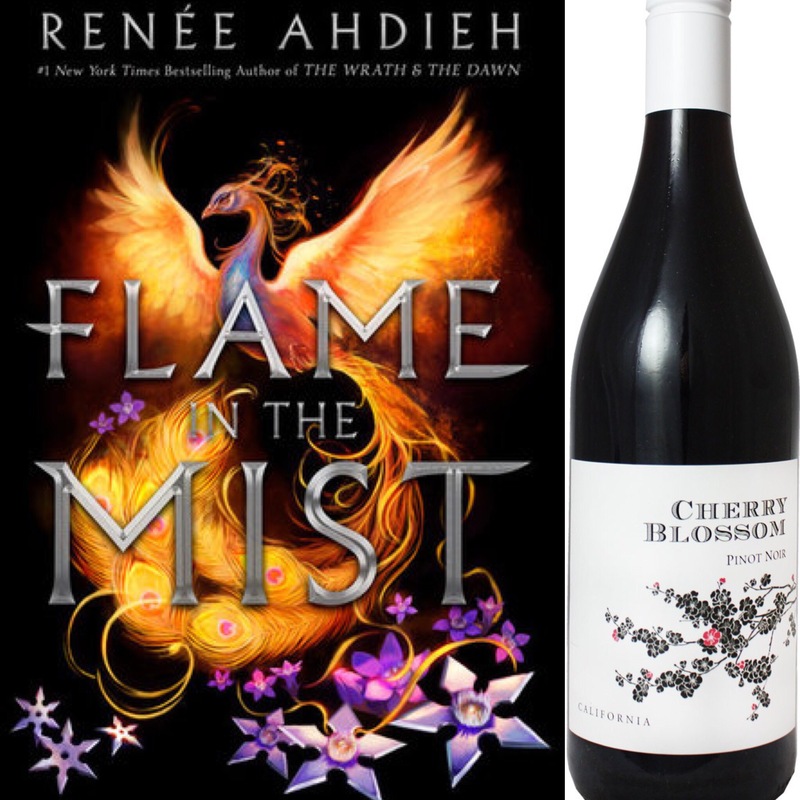 The richness of this Cherry Blossom Pinot Noir pairs perfectly with Ahdieh’s vivid writing and the lush world she’s created in Flame in the Mist. The lavish, juicy flavor is also the perfect match for the gorgeous romance scenes that Ahdieh has masterfully threaded throughout the story. Thank you Penguin Teen for granting me an ARC copy of this book in exchange for an honest review! The first thing I have to say is just WOW! This is one of those book reviews that is difficult to write, because finding the words to adequately describe a book that is this well-written, beautifully-developed, and perfectly executed is a near impossible task. I loved everything about this story from the world-building, to the characters, to the magic, to the incredibly swoony romance. This book is everything I hoped it would be and so much more. The various settings in Flame in the Mist are told with such vivid detail, I felt like I was there inside the story. The details of the forest particularly captured my attention. It is haunting, captivating, and a lovely all at the same time. There is also a bit of magic to the forest that made me fall in love with it, in spite of (or maybe because of) its darkness and secrets. There are so many incredible characters in this book, and Ahdieh expertly handled the switching of POVs, and Mariko was an ideal protagonist for me. She is a strong female character, and by “strong” I mean that she is strong in spirit, mind, and heart. She is intelligent. Getting to watch her think through situations and finding effective solutions to those situations was fascinating. She has a wonderful character arc, and I adored her for her love and loyalty to both her friends and family in spite of the fact that they weren’t all on the same side of the major conflict that runs throughout this book. Mariko is passionate, caring, smart, and everything that I look for in a main character. There is an incredible cast of characters surrounding Mariko, who I also fell in love with. They all have hidden depths and motivations and getting to see more and more of each their characters unfolding as the story progressed was just so much fun. I love books that include secret societies in their stories, and the Black Clan is a secret society that is captivating on so many levels. I can’t say anything more about them without including spoilers, but I am certainly excited for this book to be out in the world so I can discuss them ad nauseum with my fellow voracious readers. From reading the description of this book, I expected to enjoy the plot, the characters, and the world. I did not see expect for there to be such an incredible and intense romance though, and that unexpected element of this story in combination with everything else that I loved about it, is what propelled Flame in the Mist from being a great book to being the best book I’ve read so far this year. 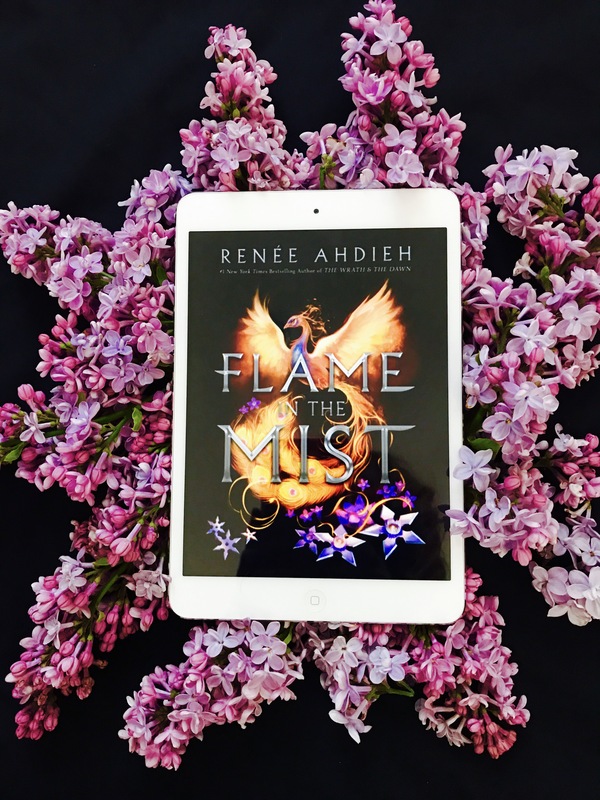 There are some books coming out this year that sound like they are just going to knock our socks off, but it will be amazing difficult for any of them to top Flame in the Mist for being the best YA fantasy novel this year. This book is a masterpiece in storytelling. I cannot think of a single way in which it could be improved, or that would have made me enjoy it more. This is pure perfection on a page, and I will be enjoying every second of anticipating the next book’s release. This is also the best YA book cover I have seen this year, and that is saying something. YA books have their cover game on point, and this cover is certainly going to push cover artists to continue stepping up their game. Everything about this cover is perfect. The color scheme is gorgeous. The cherry blossoms that transform into throwing stars are symbolic and important to the story. And this cover also just has this underlying magical vibe to it that so perfectly mimics the tone of the novel itself. Oh my sweet, beautiful, and unexpected romance! I will not say who Mariko’s love interest is, because spoilers, but I will say that their chemistry is off the charts! I haven’t felt so swept away by a romance in a book since ACOMAF last year. This book has all of that heat, but without all the graphic details. For the record, I’m not bagging on those graphic details. I love ACOMAF, but sometimes I do prefer for those details to be left off the page, and for the author to focus more on the emotion going into the scene than on the physical action itself. Have you gotten to read this gorgeous, GORGEOUS novel yet? Will you be reading it when it comes out next month? Are you a fan of Ahdieh’s The Wrath and the Dawn series? Thanks so much! I hope you enjoy it as much as I did! I still have to read it before it’s gone! So I’ll be doing a marathon read if I must!! Oh, did you get an eARC then? You definitely need to marathon it! It’s so worth it!!! Yup…need to get it read quickly now! Aw, thank you! It is a gorgeous book! Ooh, if you preordered make sure to submit your confirmation to penguin teen. You can win a trip to Book Con with Renée Ahdieh! I absolutely can’t wait for this book!!! Oh my gosh, it’s incredible! I can’t wait to start seeing everybody’s reviews on it, so we can all fangirl together! great review and yes, that cover is just gorgeous! Thank you! Yes, that cover is just stunning! I can’t wait to get a hardcover copy! I’m so excited for this book and you’re review only makes me more excited! It sounds excellent! And I agree about the cover. It’s phenomenal. Aww, I’m so glad to hear that! I absolutely adored it. Obviously. 🙂 And YYAASSS! That cover is just beyond gorgeous! So glad to hear you loved it!! I’ve been extremely excited about this book for some time now, as Mulan is my favorite Disney princess! She’s so fierce, creative, and authentic. Thanks for the review, I’m looking forward to the release date even more now! Thank you! This one is definitely a book that lived up to all of its hype. I love to see that other people are giving it such rave reviews also! I swoon every time I see that cover. *flails about* ROMANCE COMPARED TO ACOMAF????? I DON’T THINK I CAN HANDLE THIS. INSANITY I DARE SAY. *deep breaths* I must get this. It has to happen. Wonderful, wonderful review! Oh, good! I hope you enjoy it as much as I did. Seriously. I don’t know if I’m going to sleep at all in May with all of these releases! Forget not sleeping in May!! How about the whole year with the aftershock of awesome books (and perhaps some not so cool books) affecting our sleep!!! It’s true. Who needs sleep when you have books anyway? I hadn’t really heard much of this one, which is a shame because it sounds amazing??? I need this book!! Yes! You definitely need this book! I know some other people with ARC copies floating around out there, so I’m sure you’ll start hearing more about it soon! I have been struggling with a lot of YA lately, but this one is defintely going on the TBR! Your review solidifies all of the seemingly deserved hyped 🙂 Very nice! Well, I hope you like it as much as I did then! Now I’m nervous. LOL. Oh, yay! I’m so excited for you, Jackie. I hope you enjoy it as much as I did! Can’t wait to read your review.